Where do you live and what’s it like riding in your city? Burlington is cold, windy and on a gigantic hill—perfect for biking. 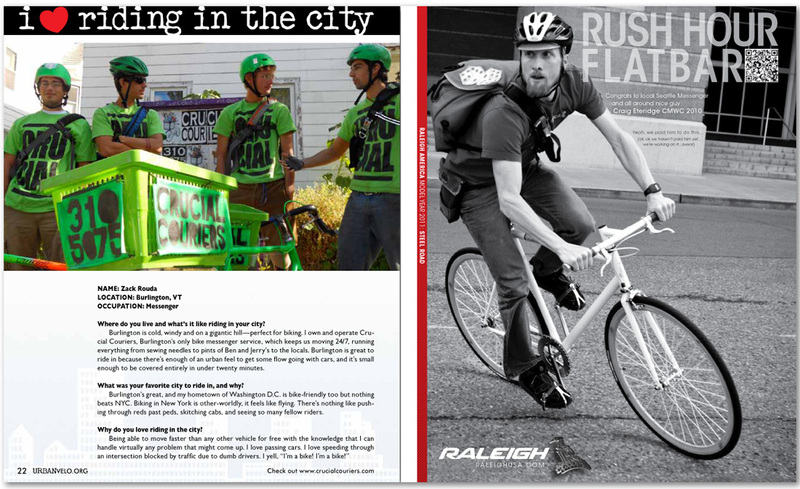 I own and operate Crucial Couriers, Burlington’s only bike messenger service, which keeps us moving 24/7, running everything from sewing needles to pints of Ben and Jerry’s to the locals. Burlington is great to ride in because there’s enough of an urban feel to get some flow going with cars, and it’s small enough to be covered entirely in under twenty minutes. What was your favorite city to ride in, and why? Burlington’s great, and my hometown of Washington D.C. is bike-friendly too but nothing beats NYC. Biking in New York is other-worldly, it feels like flying. There’s nothing like pushing through reds past peds, skitching cabs, and seeing so many fellow riders. Why do you love riding in the city?